An Oklahoma man accused of stabbing his wife 41 times in front of her young children was arrested Wednesday night at Dallas-Fort Worth Airport, according to federal court documents. Luis Octavio Frias, 34, was added to the U.S. Marshals’ 15 Most Wanted fugitive list in November. On Aug. 8, 2013, Frias attacked his ex-wife Janett Reyna as she entered his mother’s apartment in Blackwell, OK. She was there to pick up their three children. She was stabbed 41 times in front of her children, according to the U.S. Marshals. Reyna had filed a protective order against Frias two days before her death. “When Reyna was killed, she was serving as the domestic violence prevention coordinator for the Ponca Tribal Police Department, where she worked tirelessly to protect victims from the same violence and abuse that ultimately ended her life,” said U.S. Marshal Johnny Lee Kuhlman of the Western District of Oklahoma. 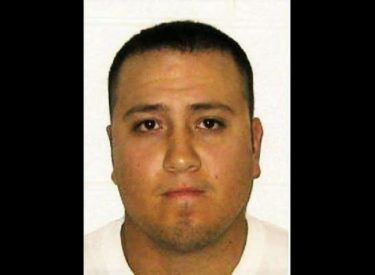 Frias was wanted for first-degree murder. An arrest warrant that was issued on Oct. 4, 2013, was returned on Thursday citing the DFW Airport as the location where Frias was found. The U.S. Marshals’ later said that a tip generated from the television show “In Pursuit with John Walsh” led authorities to Jalisco, Mexico, where Frias was located and arrested at approximately 7:30 p.m. Eastern Time on Wednesday. The warrant was officially signed upon Frias’ reentry into the U.S., via the Dallas-Fort Worth Airport. When Frias arrived back on U.S. soil Thursday, U.S. Marshals used the same handcuffs issued to Reyna by the Blackwell Police Department to take Frias into custody. According to a criminal complaint filed in 2013, Frias’ aunt drove him to Wichita, Kansas, the day after the alleged attack. He told the woman he was going to catch a bus to Mexico. A year after her death, friends of Reyna’s created a Change.org petition to extradite him from Mexico.